American Soldiers Died to Give Afghan Women “Flower Literacy”?! I kid you not. We are spending money to teach Afghan Muslimas “floral literacy.” No, it’s not instructing Muslim women in the appreciation of roses and gardenias. Or even poppies, for something beyond their illicit drug value. It’s to teach the Afghan women how to make floral arrangements . . . which I’m sure is in high demand in the mountains and caves of the Korengal Valley. Attention, USAID, they live in Helmand Province, NOT Hollywood or La Jolla. And, anyway, I heard the pink jihad club of gay Afghan Muslims called. They don’t want the competition. Business is already so slow, as there aren’t enough goat and Bacha Bazi parties to go around. 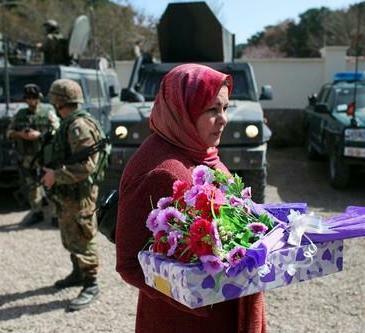 I’ve seen photos of some Afghan women trying to sell garish floral arrangements to Italian soldiers (who weren’t buying), but they’ve pulled out, and when all Western soldiers are gone, the flower biz will dry up. This isn’t exactly “teaching them to fish” or modernizing them. U.S. taxpayers paid Afghan entrepreneur Ajmal Hasas millions of dollars as part of a plan to win over villages in the country’s insurgent heartlands. . . .
Mr. Hasas was a point man in a $400 million U.S. Agency for International Development campaign to build as much as 1,200 miles of roads in some of Afghanistan’s most remote and turbulent places. Three years and nearly $270 million later, less than 100 miles of gravel road have been completed, according to American officials. More than 125 people were killed and 250 others were wounded in insurgent attacks aimed at derailing the project, USAID said. The agency shut down the road-building effort in December. . . .
A typical gravel road in Afghanistan is supposed to cost about $290,000 per mile, according to USAID. It cost American taxpayers about $2.8 million for each mile of gravel road completed by IRD [International Relief and Development, the American non-profit that ran the program], making them the most expensive miles of road ever built by the U.S. government in Afghanistan. Less than half the $269 million spent on the project went to actual road construction, IRD officials say. A quarter of the funds were paid to IRD administration and staff. About 15% was spent on security, and 8% was allocated to the community-development projects IRD said were central to the success of the project. As part of the Strategic Roads Project, USAID set aside millions of dollars in the contract to set up small soap factories, run reading programs for illiterate villagers, dig wells and teach sewing to Afghan women—all with the expectation that it would win American troops good will. But the community program was hobbled when IRD put a halt to awarding grants in southeastern Afghanistan for eight months after discovering that IRD staff were falsifying reports and exaggerating the impact of the development projects, according to former IRD workers. After revamping the staff and project, IRD resumed handing out grants for things like “flower literacy” programs that taught Afghan women how to make flower arrangements. Hey, maybe we should give ’em green cards and citizenship in the U.S. I hear Valentine’s Day is tomorrow, and someone might need a flower arrangement handmade by the craftswomen of the mountains in Afghanistan. So chic, so unique. Your tax dollars at work. Debbie if it makes you feel any better I think the billions of dollars in aid we give to Muslim countries is even more counterproductive than this stupid road project. Apparenty sending money to people who want to blow us up is the new Black. H. and I were so bored last night we watched Backdraft on TV. We liked the pretty girls in the movie but found the casting of Billy Baldwin and Kurt Russell as brothers a bit hard to swallow. We’re also curious as to how super preppy Detroit Country Day keeps producing star NBA players. Is something rotten in Denmark? A much more efficient use of money: kill the terrorist, and do a chromosome analysis. Go into a neighboring village, and any male adult who matches the chromosome analysis within a reasonable range of familial association, shoot. These guys are familial/tribal. Don’t kill innocent civilians who are unrelated to the scum you wish to get at—let it be known that terrorist association will result in the wipeout of entire male lines. This is the Kratman approach, incidentally, and it is yet another reason why Caliphate by Tom Kratman is a must read. And, as OT would know, this approach is fully in line with the sociobiological idea of “inclusive fitness.” You see, your typical Amalekite can, under certain circumstances, increase his likelihood of transmitting his genes to future generations by becoming a martyr. His offspring will be glorified because of his martyrdom. Indeed, even if he has no offspring, he is between 25% and 50% genetically related to every member of his immediate (large) family. So, his death can bring a huge dividend. That is not the Only place we need that kind of therapy! Valentine’s Day, and valentines, are considered abhorrent by Muslim religious authorities, tantamount to idol worship. Religious and civil authorities (often a distiction without a difference) in Muslim countries have, in recent years, sought vigorously to suppress this infidel-based holiday, with Muslim celebrants threatened with severe punishment. y nephew died in afghanistan because of president bongo’s rule of engagement and nation building.he was murdered by two of the ragheads who were supposed to be on a guard with him but he was the only one there, they only showed up long enough to shoot an rpg Andrew and kill him.the only thing we should be doing in afghanistan is killing lots of ragheads. You got that right, Bruce! Further, it’s important, “male lines” notwithstanding, to kill off female Amalekites especially. One dead female is a tremendous blow (as opposed to an oppressed female, who is where the family wants her). Deadly, horrid, disgraceful boondoggle @ $2.8 million per mile of gravel road. Our tax dollars hard at work. We can thank the 60’s and the offspring of the “Greatest Generation” for such ponderous rules of engagement. The 60’s brought us the most retarded generation and we are still feeling the poison of their stupid ideas. I wish I knew back near 9/11 what I know now. I would have never supported the wars the way they were engaged. I certainly wouldn’t be like the fricken’ idiots who were against the wars in the Liberal way though. Hey, do y’all notice that there are NO MORE anti-war rallies? I went to a few to support the military when GWB was President and these freaks had them twice a year. With Obama we hear crickets and not a peep about Libya and/or Uganda. No anti-war rallies. Just Occupy Filth-ins. And you know those were set up by Soros and the Unions so Bam! could demonize richy-rich Mitt Romney. NEVER forget the Left are NOT anti-war. They’re just anti-Republican President war. What I mentioned above proves it! And that screeching freak Cindy Sheehan has shut up. Hypocrisy all around! Skunky, we also are not blessed with the daily body counts. Even though we’ve recently had some of the worst months on record, not a peep. Amazing, isn’t it? Great point, Robin! Thanks for reminding us. Talk about double-standards! Well said, Skunky and Robin. We complain and we are not heard. Make a few million and give a Dem or Rep (doesn’t matter which side) a healthy lunch of Lobster salad. That is about as far as you can go…they do what they want to get money to get reelected. If we all joined the movement to vote against incumbents it would make them at least notice us. As for wasting our money, where is the $8 billion in cash that has’t been found in Iraq? The only people wo make out well are the contractors. Now if we can just teach them to stick those flowers in the gunbarrels of the Taliban. Peace.